This will be the biggest overhaul of animal experimentation regulations for nearly 25 years, as the Home Office transposes European Directive (2010/63/EU). For over seven years we have been fighting this battle in Europe – now it is here. The UK government will be amending the Animals (Scientific Procedures) Act 1986 to comply with the new Directive and can choose whether to adopt the bare minimum, or use this as an opportunity to drive forward modern replacement techniques. A choice of cutting edge or knife edge. Following meetings with the minister and Home Office officials, the NAVS can reveal that the Coalition Government is considering putting the Directive into UK law without a full public and parliamentary debate. The Home Office is looking at powers under the European Communities Act to bring in ‘secondary’ legislation. This means that the new law is written by the Home Office and submitted for a vote without full public debate. We believe that it is vital that public and parliament get the opportunity to decide on this legislation. NAVS, ADI and LDF have put together a list of key areas where the new Directive provides the opportunity to replace animal experiments, but also, we have pointed out where there could be a danger of lowering of UK standards. An aim of the Directive is to make a “step towards achieving the final goal of full replacement of procedures on live animals for scientific and educational purposes” (Recital 10). 1. End household product testing. 2. No downgrading of UK animal protection measures in the law – our rules that are stricter than the EU Directive must be maintained. 3. 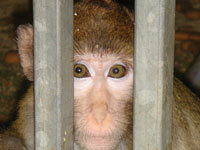 Commit to replacing experiments on monkeys in UK laboratories. Article 8 of the Directive establishes that “specimens of non-human primates shall not be used in procedures” with the exception of procedures “undertaken with a view to the avoidance, prevention, diagnosis or treatment of debilitating or potentially life-threatening clinical conditions”. 2008 EU statistics show the UK has become the no.1 user of laboratory primates in Europe, while in other countries such as France, Belgium and Netherlands primates use has dropped. Austria appears to have completely ended their use; in Germany numbers are stable. Yet in the UK primate use has jumped from 3115 to 3354. Our 2009 investigation in Huntingdon Life Sciences exposed the appalling suffering of monkeys used in contract research laboratories. 4.End the wild capture of monkeys by laboratory dealers. Article 10 of the Directive aims at ending the use of F1 primates in experiments and breeding programmes. This would stop the capture of monkeys from the wild. However, hard lobbying from the laboratory animal dealers ensured a long phase-out of F1 primates - 12 years. This is where the UK government could take the lead in Europe – by setting an earlier, more responsible and reasonable deadline. More than 50% of all primates imported to the UK are born from parents caught in the wild (F1 primates). Every year hundreds of primates are imported from Asia, where wild monkeys are caught for breeding stock to supply British labs. Wholesale capture of wild monkeys has devastating effects on the environment, and wild populations. The Home Office refusal to recognise the suffering of monkeys caught from their native environment and kept in inhumane conditions in supply centres, such as Nafovanny in Vietnam, is irresponsible and reflects the protection given to suppliers’ interests (see this issue). 5. The government should set limits on the severity of pain that animals are allowed to suffer, and the Home Office should create a list of prohibited experiments. 6. Increase transparency on animal experiments – provide more public accountability and independent scrutiny, before permission to use animals is granted. Put project licence applications online and allow organisations such as NAVS and LDF to suggest non-animal alternatives. Overhaul the local ethical review bodies, to bring in more expertise from non-animal research bodies. Recital 41 of the Directive provides that “to ensure that the public is informed, it is important that objective information concerning projects using live animals is made publicly available”. However, as many of our readers will recall, in the UK Section 24 of the Animals (Scientific Procedures) Act 1986 (ASPA), bars the release of all information on animal research from laboratories, the penalty being prison. NAVS has campaigned against this secrecy clause since 1986, and vigorously during the passage of the Freedom of Information Act 2000. We pointed out that the FOI Act adequately provides for protection of confidential information (for example intellectual property and personal details), making S.24 of the ASPA both unnecessary and at odds with FOI principles. The exemption for S.24 under FOI rules should be removed, and in this review of the ASPA, S.24 should be repealed. 7. Compulsory data sharing to prevent unnecessary experiments. 8. Establish a UK co-ordinating body for the development and validation of replacement (non-animal) methods. 9. Ensure the effective implementation of non-animal methods – where there is an alternative available, it must be used. 10. The UK should organise regular reviews to identify and agree replacement methods with binding targets for specific animal experiments and specific uses of animals, as outlined in the Directive. This should involve all stakeholders, including animal protection and replacement experts. Such targets have proved effective on the cosmetics testing issue. You can help change the lives of the 3.7 million animals who suffer and die in UK labs every year. Tell your MP you want advanced technology, not animal tests. Write to your MP – include the list above and ask them to put pressure on the government to act to replace the use of animals in tests. Take part in the government’s public consultation. In the coming week’s the Home Office will hold a consultation about the new Directive. Laboratory animals need you to be their voice. Keep in touch with NAVS to find out how to take part. Give out 25 of our ‘Cutting Edge, not Knife Edge’ leaflets – to homes near you; distribute them to friends and family, ask them to help. Give one hour a week to helping this campaign. Keep in touch with NAVS. Sign up for our email alerts, or call us on 020 7630 3340.